"You can talk of your generals and your colonels and your majors," said the Digger, looking aggressively round the table at our Friday luncheon club, "but where would they be without the rank and file to do the job?" Don't look at me in that tone of voice," pleaded the Major, "because I rather agree with you." Who doesn't'" asked the Skipper "I'm a seafaring man, but I've read and heard enough about warfare to know that if you can't rely on the private soldier, all the brain work and organisation of the Higher Command goes for nothing." All the same, "growled the Digger, "it's not everybody that will give the rank and file their due "
Look here," put in the Signals Officer". "I think you've got a story or something". "Have you been reading about some super private who saved the situation and won a peerage?" "Not a peerage'" said the Digger "The VC." Then you have got a story!" The Signals Officer looked triumphant "What about giving him the floor, Skipper?" "He s got it" said the Skipper, ordering the same again. John Ryan was born at Tumut (NSW) in February 1890, said the Digger. 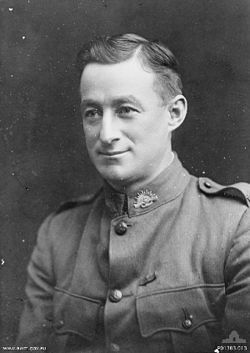 He enlisted at Wagga in December, 1915, and went overseas with the 55th Battalion He gained the Victoria Cross on September 30, 1918, the day after we began our assault on the Hindenburg Line. He won his award as a private soldier, and as a private soldier he performed prodigious feats of arms that almost put him in a class by himself. You know how we battered ourselves against the Hindenburg Line, until Foch decided that every sacrifice must be made to overthrow the German defences there before 1918 ended. Ryan's crowd was in it from the word "Go." Remember the artillery bombardment of Jerry's lines? It began on September 26, as a curtain-raiser to an attack by two American and three Australian divisions, plus Corps troops - about 200,000 men. Remember how the Americans went on, and the Germans popped up from their underground "hideouts" along the canal and held up the Aussies in the second phase of the operations? The Allied plans miscarried. There could be no methodical advance covered by a coordinated artillery barrage. Progress depended on the tenacity and leading of the front line of the troops. It was bomb and bayonet business for the Diggers. Sir John Monash labelled it "a private soldiers' battle." The day after the hop-over there was some pretty tough hand-to-hand fighting in that tangle of trenches, but it wasn't till October 1 that the Germans yielded and the Hindenburg Line began the "pack up" that ended the war. Now listen to what Jack Ryan did on that second day of the assault. He was one of the first men in his company to reach their objective trench. He went into action with such dash and used his bayonet in such an inspired fashion that his cobbers seemed ready to follow him anywhere. They took a terrible belting from German artillery and machine guns, but they gained the trench, and with Ryan's example to sustain them, hung on to the death. Then they found there was a big gap between the left of Ryan's unit and the unit on the flank. Before there was time to do anything about it the Fritzes counter-attacked. Some of them got through the gap and bombed our lads from the rear. Something had to be done - and done quickly. Ryan summed up the situation instantly. All the officers and N.C.O. 's had become casualties. Somebody had to take charge. Quickly Jack Ryan got together a few men. With bayonet and bomb they rushed the Germans. They ran right into a hail of bombs. Ryan reached the enemy position with only three men. The quartet of Diggers was outnumbered, but by skilful bayonet work they killed three Germans, and rushed the remainder with bombs. At that moment Ryan fell, wounded in the shoulder. But his dashing assault had driven off the Germans, and those who had not been killed or wounded by his bombs were picked off by our Lewis gunners as they panicked across No Man's Land. For two days Ryan's battalion and another fought skilfully and bravely in the position won by his amazing courage and resourcefulness. Inspired by the thought of what he had done, the men fought like demons and kept the Germans at bay during one of the critical stages of the assault on the Hindenburg Line. Yes, it was a private soldiers' war, all right; and when an officer of the calibre of Sir John Monash admits that the position couldn't have been taken but for the work of the humble infantryman, who's to contradict him? This story in The Argus was part of an inspiration series on VC winners. Less than a month later the same newspaper published the news of the death of Ryan read . Ed. Extracts from Secrets of the Anzacs re John Ryan VC (477 words). This remarkable collage (left) was one of a number commissioned by Melbourne business identity John Wren. It features 14 Victoria Cross awardees of World War I, all of whom served with the Australian Imperial Force. This was the copy presented, as the title says, by the Catholic Archbishop of Melbourne, Daniel Mannix to Lieutenant John Hamilton VC. 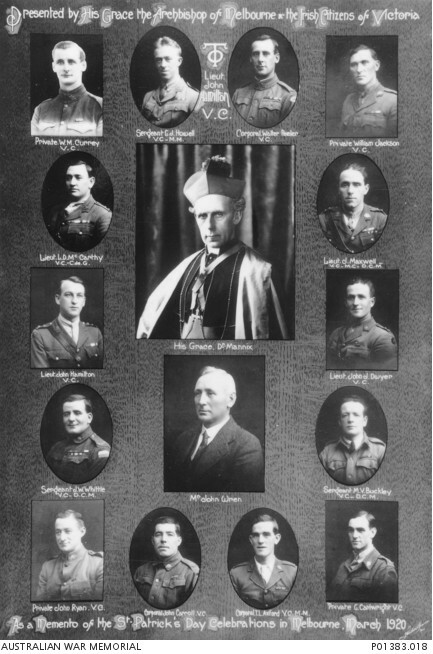 Hamilton's portrait appears just to the left of the Archbishop from the viewer's perspective and he is the only one of the nine Australians who were awarded VCs during the Gallipoli campaign featured here. The other thirteen VCs all gained their awards for actions on the Western Front in France and Belgium between 1916 and 1918. The story behind this collage is complicated. Basically, in the immediate post-war period there was a struggle going on in Ireland to end British rule there. Mannix, an Irishman, was a strong supporter of the Irish cause and in Australia at the time the strong Irish-derived Catholic community in general also supported the Irish demand for self government. Some Australians accused the Catholic community of disloyalty to Australia and the Empire and a great many bitter public meetings and demonstrations were held by both sides. The Australian press in particular took a decidedly pro-British line in the conflict. 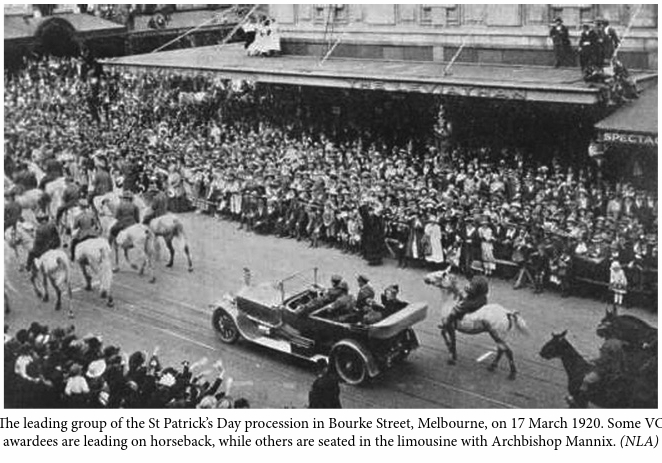 In 1920, a special St Patrick's Day parade took place in Melbourne in which Mannix's car was preceded through the city by 14 Australian VCs in uniform mounted on grey horses. John Hamilton VC took part in this demonstration of Irish-Australian solidarity with Ireland's cause, a demonstration which was also calculated to indicate by the presence of these VCs, and many others in AIF uniform, that Catholic Australia had been loyal to Australia's cause during the war. What is interesting is that four of the VCs were not Catholics, an indication that support for Ireland was also there in the broader community. 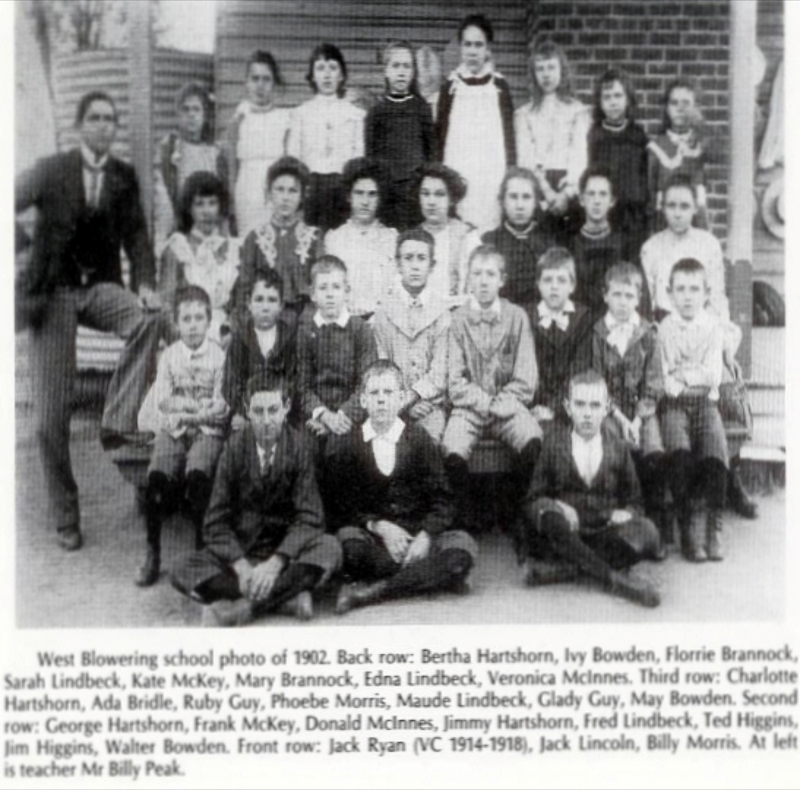 This photo came from the collage below. Private John Ryan, V.C., hero of the last war, who died in hospital yesterday from pneumonia, had battled for years against adversity. He died in want at the age of 54 years. He had tramped the streets for months looking for a job, and on the day he was to have started work he had to be taken to hospital. 25 July 1941 Northern Standard (Darwin NT). 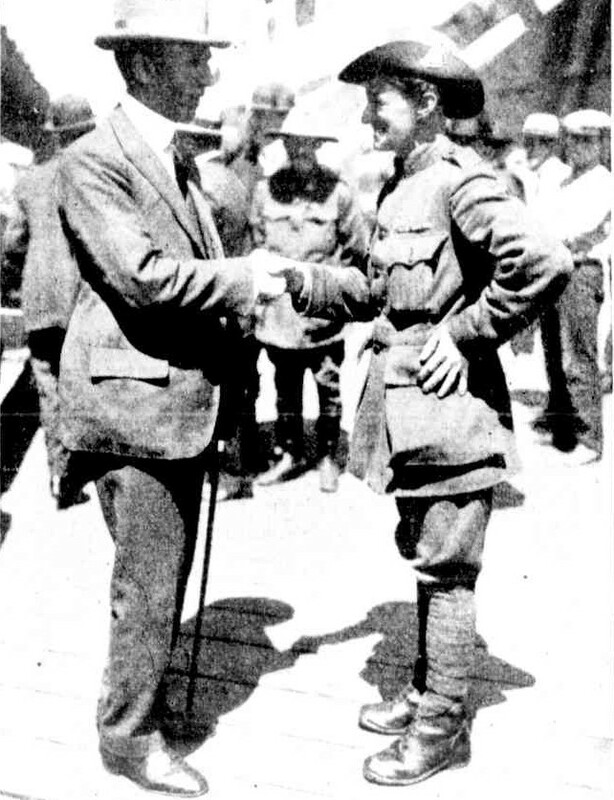 Premier of NSW welcomes John Ryan VC on his return from the war. 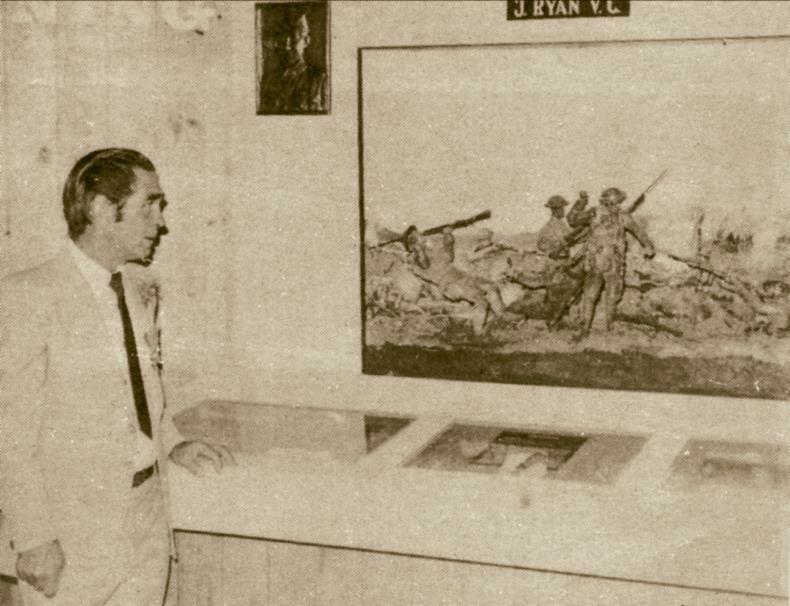 Tragedy lies behind the death in hospital of Edward John Ryan, V.C., a hero of the last war, who had battled for years against adversity. He died at the age of 54 years, in want. Ryan received the V.C. for driving back the enemy in the Hindenburg Line with bombs and bayonet after all his companions had fallen. People's memories are very short. The debt due to the men of the 1914-18 war can never be paid. At the time, this was the largest crowd in Melbourne's history. Ryan was riding one of the white horses. Loved brother of Malcolm, Reg, Eileen, and Phylis, aged 54 years. News reports such as these two appeared across the country. Jim Beattie with the finished diorama in Tumut R.S.L. Club, 1981.